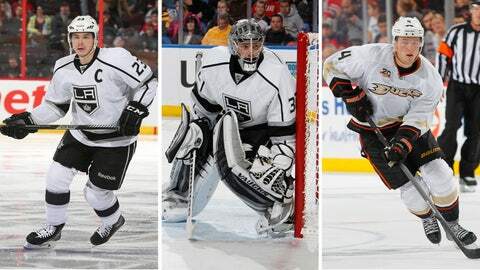 Kings teammates Dustin Brown and Jonathan Quick and Ducks' Cam Fowler were named to the U.S. Olympic hockey team on Wednesday. Kings goaltender Jonathan Quick and forward Dustin Brown, as well as Ducks defenseman Cam Fowler, are among the 25 players on the U.S. roster for the Sochi Olympics, as announced after the Winter Classic game Wednesday. The biggest surprise was the omission of high-scoring winger and former Duck Bobby Ryan, but he might be among the designated alternates who could join the roster if one of the original choices is injured. Concerns about his skating and defensive abilities on the wider international ice surface might have played into the decision to leave him off the roster. In addition, team executives had to fill roles such as penalty killers and power-play units, rather than simply picking an all-star team. Injuries have overshadowed the selection process: Quick hasn’t played since Nov. 12 because of a groin injury, St. Louis forward David Backes has been out of the Blues’ lineup because of an undisclosed injury and Pittsburgh defenseman Paul Martin has a broken leg. "It’s always obviously a huge honor to represent your country," Brown told The Times’ Lisa Dillman before the announcement. "What I always say about the Olympics, it’s another level. Doing it in 2010, going in to it, you didn’t know what to expect at the Olympics. It’s an awesome tournament, just a really fun thing to be a part of." Brown and Quick were members of the silver medal-winning U.S. team at the Vancouver Olympics. Thirteen players with Olympic experience were named to the roster. Here’s a link to USA Hockey’s formal announcement. Quick, Ryan Miller of Buffalo and Jimmy Howard of Detroit were designated the three goalies. In addition to Fowler and Martin, the defense will be John Carlson of Washington, Carolina’s Justin Faulk, the New York Rangers’ Ryan McDonagh, Pittsburgh’s Brooks Orpik, St. Louis’ Kevin Shattenkirk and Minnesota’s Ryan Suter. Faulk is the team’s youngest player, at 21. The forwards, besides Brown and Backes, are the Rangers’ Ryan Callahan, Chicago’s Patrick Kane, Vancouver’s Ryan Kesler, Toronto’s Phil Kessel — whose sister, Amanda, was named to the U.S. women’s Olympic team earlier in the day – St. Louis’ T.J. Oshie, Montreal’s Max Pacioretty, Minnesota’s Zach Parise, San Jose’s Joe Pavelski, Colorado’s Paul Stastny, the Rangers’ Derek Stepan and Winnipeg’s Blake Wheeler. There’s a lot of good hockey players fighting for those spots. Before the announcement, Fowler told The Times’ Lance Pugmire that he was "a little nervous." Fowler added, "Something to be excited about, you never know what’s going to happen. I feel like I’ve put myself in position to at least have my name thrown out there, so we’ll see what they say. I’m a confident player, I know what I can bring to this team. I’ve had my ups and downs in past years, but I knew the situation I was put in this year and I think I’ve been able to respond to that pretty well. I think that’s what USA hockey and the Ducks wanted to see. "I don’t want to have any expectations. There’s a lot of good hockey players fighting for those spots" I know some of the guys that are on the bubble, they’re all having great years. It comes to personnel and what kind of style they’re looking for. I’m happy I’m in the position I’m in, just a little bit nervous about it."